Enrich the spirit of your Christmas season by celebrating Advent, the four weeks leading up to Christmas; a time of penitence and hope. Calendars, colors & candles enrich the weeks leading up to the birth of Christ. The Christian holidays - holy days - we celebrate now are remnants of an entire year of events that were meant to help us feel the love of God every day of the year. Much of the meaning of Christmas was lost when people began to celebrate Christmas alone, without the preparation of Advent. More has been lost since Christmas, for many, became a just day off work and a time for buying gifts. We can renew the Christmas spirit for ourselves, our families, and our loved ones. But we can't do it in a day. If we run around in the slush and snow buying gifts and trying to wrap up our work year, it will be hard to find deep joy of spirit at Christmas. Advent, you might say, is a way to give yourself a running start towards a wonderful Christmas. By celebrating each day of Advent from the beginning of December, we can remind ourselves daily of the coming birth of Christ. I know how busy we all are. But just five minutes a day can bring us to the joy of Christmas and the hope of Christ. The key is not in how much time we take, but in the depth of our prayers, meditations, and feelings. It may come as a surprise, but all Christians do not celebrate Christmas. The Puritans, for example, who settled New England starting in 1620 when they came over as Pilgrims on the Mayflower, celebrated the first Thanksgiving, but did not celebrate Christmas. Christmas is not found in the Bible, and the Bible sets no date for the birth of Jesus. The Catholic Church selected December 25th to compete with pagan Roman holidays. The Puritans sought purity and returned to the Bible, eliminating many Catholic expressions of Christian faith. Catholics, Anglicans, Episcopalians, and Lutherans generally celebrate Advent a four-week Advent. The Eastern Orthodox celebrate a similar time called the Nativity Fast, but it is longer, about 40 days. 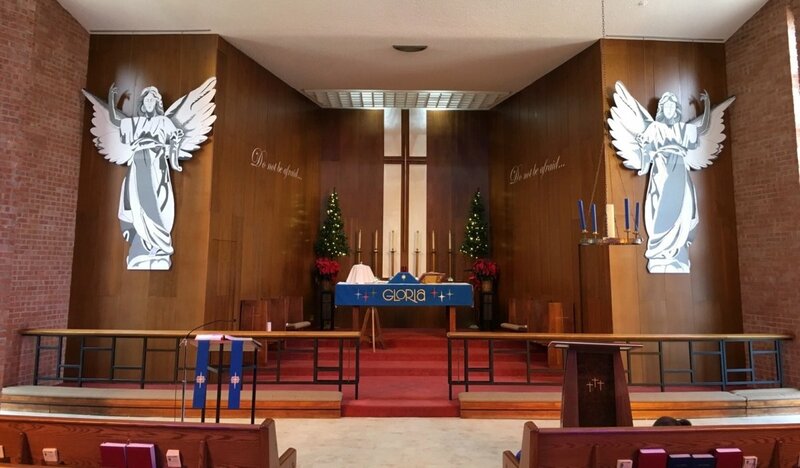 Most Protestant denominations pay little attention to Advent - but don't let that stop you! Take a moment to pray, especially together. If prayer feels awkward, just hold hands and bow your heads together for a moment in silence. Take a moment to share feelings about the meaning of Christmas. Take a moment to share gratitude for each other and God. Come together for dinner, or the main meal of your day (even if it's breakfast). If you don't pray already, give it a try. If you do, add a special thank-you to the prayer. Come back to this hub, and share it as an online Advent Calendar. 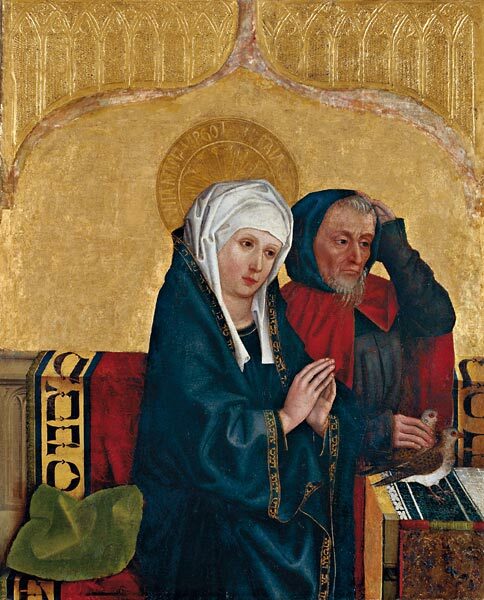 The traditional colors of Advent have changed over the centuries. The original color was purple, symbolizing penitence. In medieval times, the general emotional view of the Catholic church was that we were all sinners. Repenting was the act of recognizing our sins. Offering acts of penance - such as wearing purple and saying special prayers - was asking God to forgive us. And when God forgives the world, Christ will return in the Second Coming, and the world will be saved forever from sin. Christmas is a reminder not only that Christ came once, but also that he will come again. So, by wearing purple and holding a penitential attitude, Christians of the Middle Ages believed they were doing all they could to bring the Kingdom of God soon. In the last couple hundred years, blue has become a common color of Advent. Why the change? Blue symbolizes hope. These days, most Christian traditions focus less on sin and more on faith. So, wearing blue, we now wait in Hope for Our Lord's return. 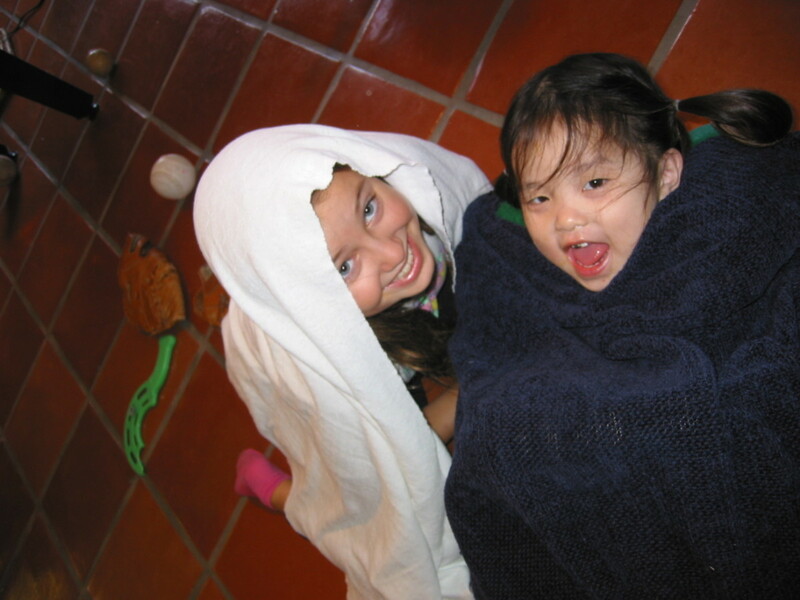 Wearing blue in Advent says, "We know you came once, as a babe and a human among us. We know you will come again to end the sin and suffering of the world. We hope you will come soon." The third Sunday of Advent opens with a prayer that begins "rejoice." To mark this joy, purple penitence and blue hope are replaced, for a day, with the rose light of joy. So the third candle in an Advent Wreath is often rose, instead of blue or purple, and rose vestments are worn in the church on this day. Of course, most people think of green and red as Christmas colors. Many may not even know that Advent has its own colors, different from Christmas. As a result, as the streets and shop-windows get decked out for Christmas, many people think that green and red are advent colors. 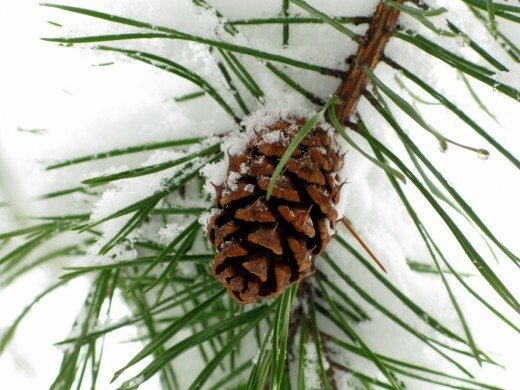 Green is for eternal life, especially for the evergreens that keep their needles through cold northern winters. And red is for the blood of Christ. The blood here symbolizing not death and sacrifice (as at the Easter crucifixion), but the living blood of Jesus, and the miracle of God being born as man. More advent colors turn up from time to time. Last Sunday, my wife said the vestments at the local Episcopalian church were green on the first Sunday of Advent. That's not official! 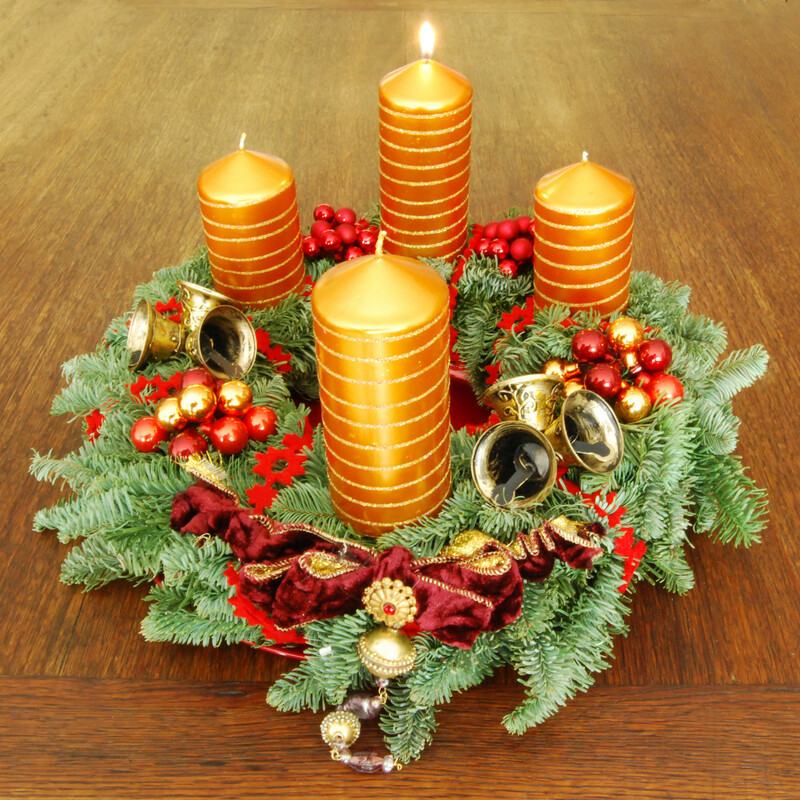 The Lutherans of Germany bless us with the Advent Calendar, Advent Candles, and Advent Wreath. Starting in the early 1800s, German families began marking off the days of December in anticipation of Christmas. Some lit a new candle each day, and some candles were put on wreaths. Some simply made chalk marks on their door, the way that we cross off days on a calendar. Others would hang a religious picture on the wall each day. 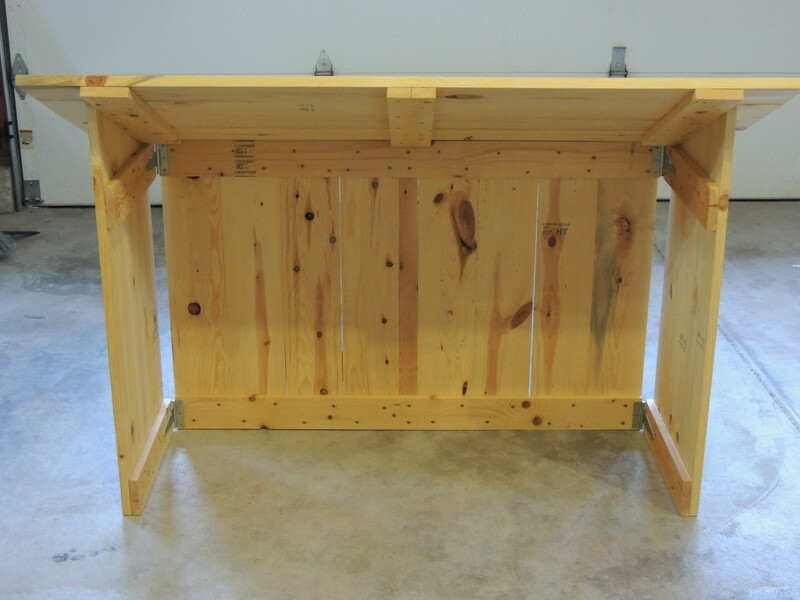 The first known Advent calendar was handmade in 1851. If you want to make your own Advent Calendar, RandomCreative offers these instructions for making an Advent calendar that hold little gifts and is made on a cookie sheet. The first time I saw an Advent calendar was when my girlfriend's mother sent her a printed calendar made of paperboard. That was over 30 years ago, that girlfriend is now my wife, and we've gotten one almost every year since. But my mother-in-law is getting old, and she didn't manage to send one this year. Maybe that's why I'm writing this article: I want to bring her generosity to the next generation and pass on these wonderful calendars to you. Printed advent calendars, made on poster board with little windows that open to show cute pictures or Bible verses, were made popular by Gerhard Lang, who printed them in Munich from 1908 until the 1930s. Printed Advent calendars were not available during World War II. After the war, Richard Sellmer of Stuttgart began sellling commercial Advent calendars around the world. Other calendar printers have followed suit. Today's printed advent calendars have a picture on a piece of cardstock and 24 windows that can be opened. Each window is numbered for a day of the month of December. Opening the window reveals a picture, a Bible verse, a poem, or a step in the story of the birth of Jesus. December 24th, Christmas Eve, usually shows a picture of the baby Jesus. Some Advent calendars are religious, others are more secular, showing candy canes, snowmen, and gifts related to popular Christmas themes. I'm building an online Advent calendar right in this article. Keep scrolling down. I'll be adding pictures all the way to Christmas! 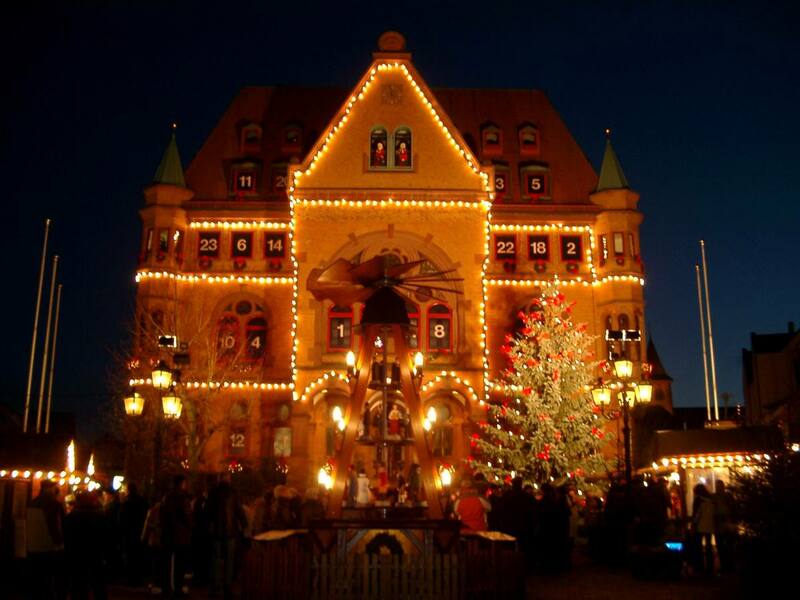 A Town Hall Becomes an Advent Calendar! An Advent Candle is a tall candle with 24 days marked off in even spaces. One segment is burned each night, often at dinnertime, then the candle is blown out. 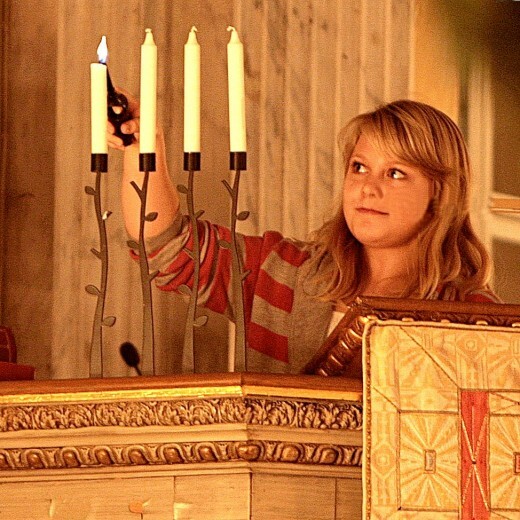 The number of the next day remains visible as the candle burns down, and people anticipate the coming of Christmas. Advent candles are most popular in European homes. The candle may be placed in sprigs of evergreen, or in a simple candle holder. 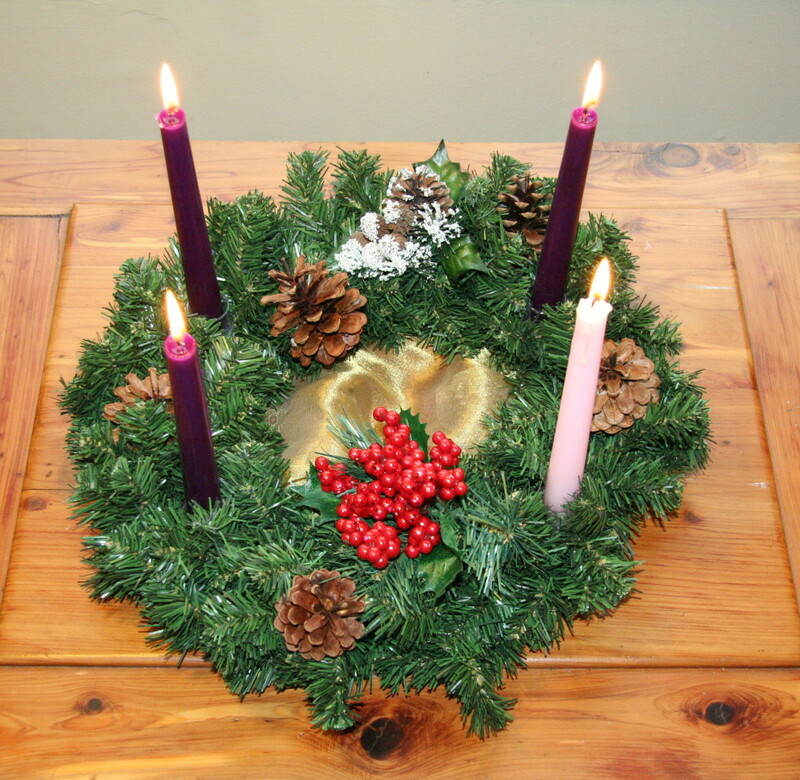 An Advent wreath is an evergreen wreath with candles in it. the candles mark either the four Sundays of Advent or all 28 days of the four weeks of Advent. The candles may be red, creating a red and green Christmas color set, or purple or blue. 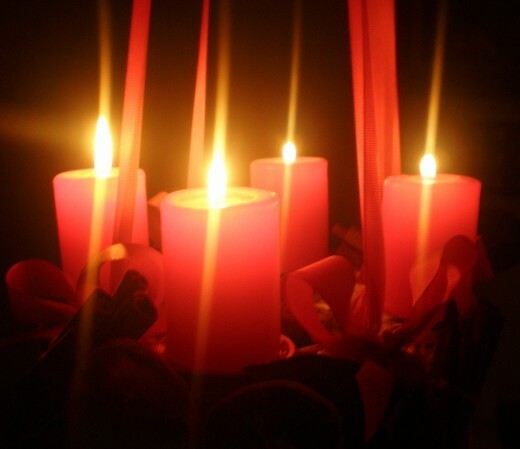 And the third candle may be rose, recognizing the third Sunday of Advent as a day of special joy. The candles are not burned all the way down. You can tell which Sunday of Advent it is by the number of candles burning. 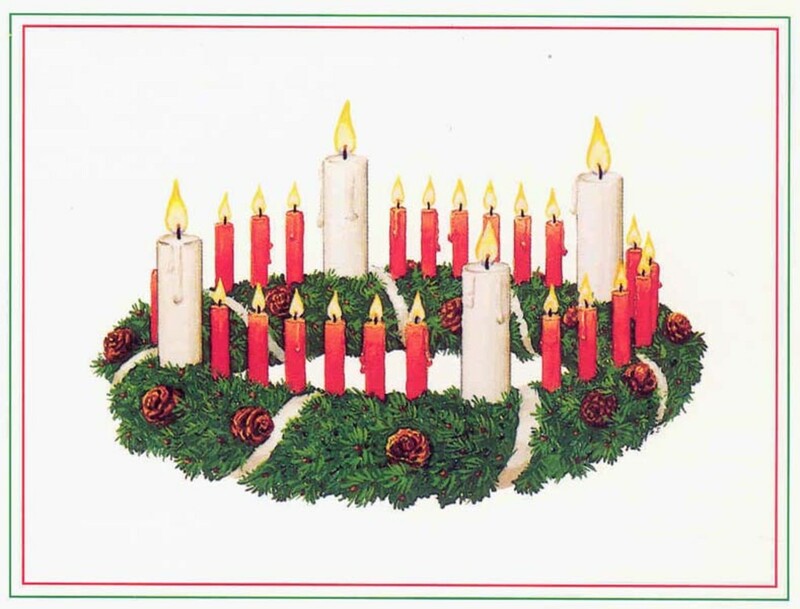 And some wreaths have a fifth candle, usually a white one, to be lit on Christmas Eve or Christmas Day. The circular or ring-shape of the wreath symbolizes eternal life, especially because it is evergreen. And the candles lit in winter represent the primal theme of many faiths, "even in darkness, there is light." Christians remember that the Lord of the World was born, in legend, at the darkest time of the year. It appears that the original Advent wreath was designed by Pastor Johann Hinrich Wichern for children at his mission school in Germany in the mid-1800s. 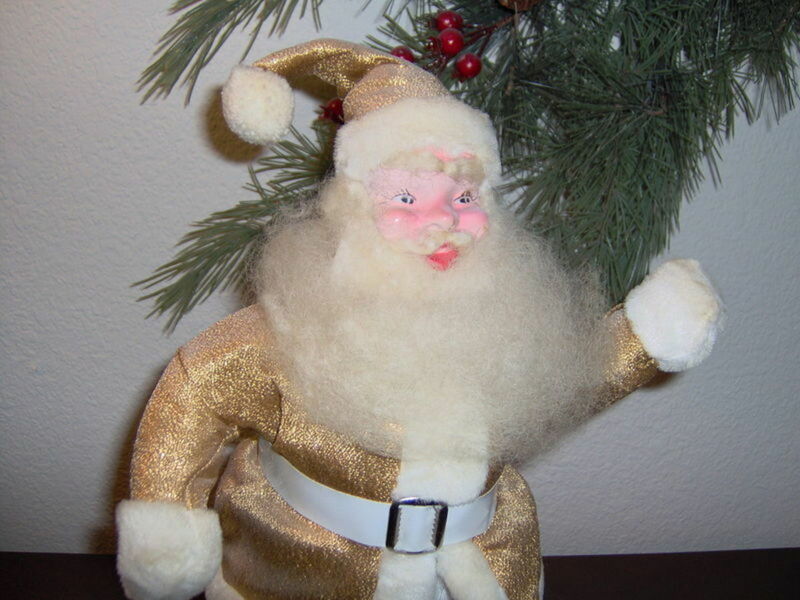 Legend has it that, all through December, the children were constantly badgering him with "Has Christmas come? Has Christmas come?" He build a wreath with small candles for each day and a big candle for each Sunday to keep the kids from pestering him! For me, there is no better way to build the anticipation of Christmas than with Christmas music all month long. My wife and I agree - no Christmas music until after Thanksgiving! We don't want to spoil the joy of it. Most people think that Christmas music is stable, but, actually, it changes every 20 years or so, in a big way. She likes a Renaissance Christmas CD, and I can't understand a word they are saying. I really like an early American (early 1800s) Christmas CD, even though there's almost no mention of winter or cold. My wife likes a New Orleans Jazz Christmas CD because she lived in New Orleans for a couple of years. I like Bing Crosby and 1940s Christmas, because they were my mother's favorites, and that's how I remember her. We both really like a capella Christmas carols. We can enjoy each others favorites because we can enjoy their joy! My own personal favorite Advent carol is Joy to the World. Each of the four verses shares a very special part of the meaning of Christ's coming into the world. Advent begins four Sundays before the Sunday before Christmas. But, of course, Christmas falls on different days in different years. In 2012, Advent started on December 2nd. 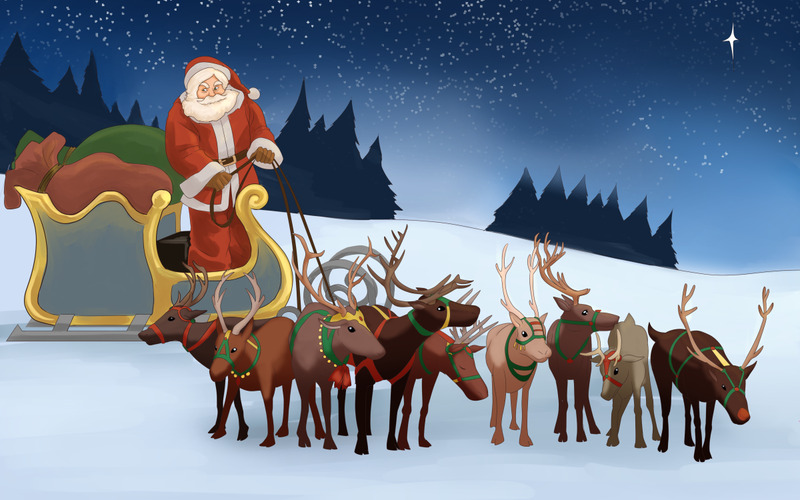 But the date can vary anywhere from November 27 to December 3, depending on what day of the week Christmas falls. However it has become popular to celebrate Advent for the first 24 days of December, beginning December 1 and ending on December 24th, Christmas eve. Why? Because it's simpler! 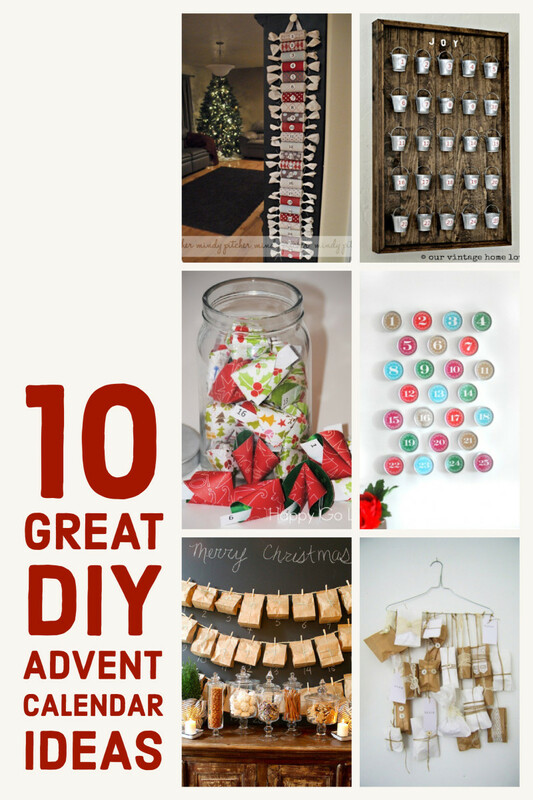 Help Build an Online Advent Calendar - Right Here! 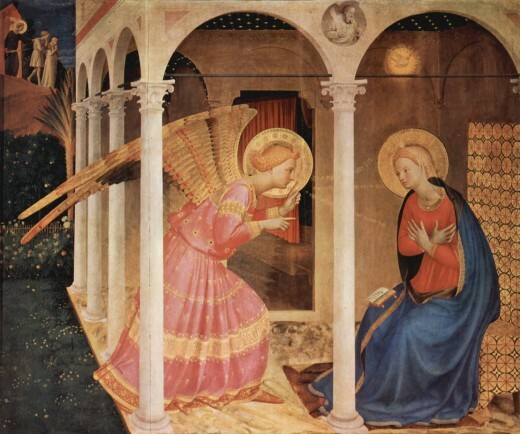 You can come right back here to this article to feel the spirit of Advent. I've started an Advent calendar with one photo for each Sunday and an image for Christmas Eve. You can help me grow the calendar until we have an image for each day. If you have a favorite photo you want me to use, just say so in the Comments below. If it is your own, please give me permission to use it. If it is not, please make sure it meets HubPages requirements for posting. I'll add the beautiful images you propose, and we'll celebrate Advent together, day by day. Yes, Silver Fish, interesting indeed. The interactions between pre-Christian pagan customs and the rules of the various Christian sects is truly fascinating. There are so many variations. Thank you for sharing. The hanging of an evergreen wreath is a very old pagan custom in Europe which predates christianity by many thousands of years. Interesting to note that holly wreaths were banned in my country ( Scotland) by the christian church- indeed any "christmas celebration" was illegal for nearly 400 years and only became accepted again as a cultural custom in the 1960s. Hi Paul - Thanks for the fine memories. My wife's family introduced me to the creche and to hanging genuine lead tinsel (no longer available in the US) on the tree. Interesting hub--I didn't realize that the advent wreath was a recent invention, but that makes sense since it doesn't 'feel' as old as Christmas traditions like the creche. I really like how you use traditions like Advent as a way of deepening our own spiritual practice, and you do that without disparaging the commercial side of the holiday. In my family, we had the wreath, a creche and carols, and on the evenings before Christmas we did things like stringing popcorn onto the Christmas tree--something handmade, which we later shared with the birds on Christmas day. 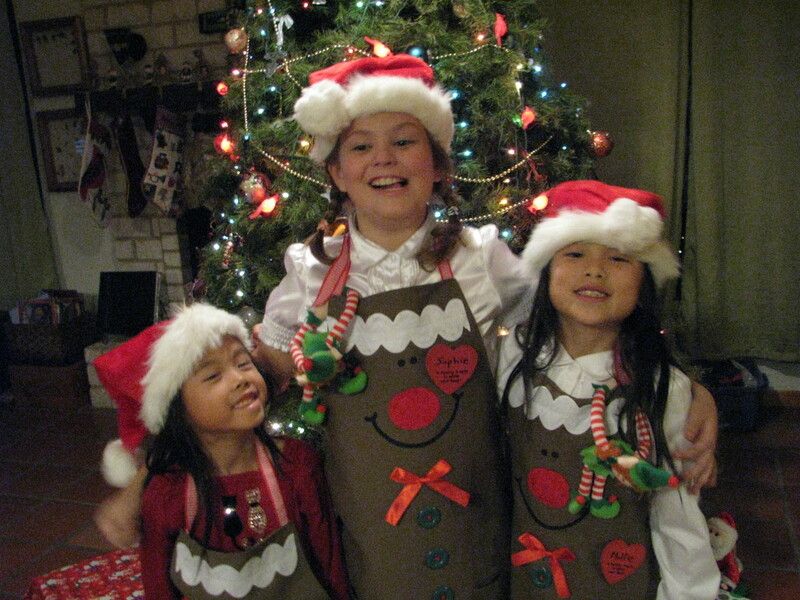 And like you and your mother, we listened to Bing Crosby's holiday music. :-) Thanks for sharing this lovely piece.